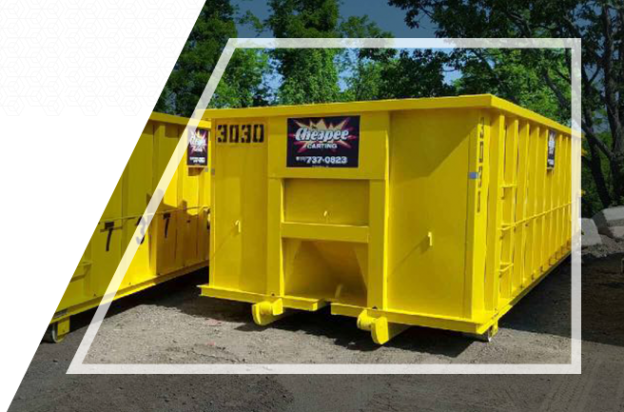 Mr. Cheapee, Inc. is licensed in Westchester & Putnam counties to provide roll-off containers which can be used for construction debris, demolition debris and household junk. We have the experience and equipment to provide containers from 10-30 yards same day. We have small unit trucks for 10 & 15 yard containers that can fit in those hard to get places. We can also provide manpower to load your dumpster. Please contact us to find out how you can save on our REALISTIC rates and weight limits we provide to both homeowners and contractors! We have 10, 15, 20 & 30 yard roll-off containers. You load or we load. One easy phone call can get you a dumpster rental today. We provide fast delivery and on-time pick up of your roll off container. And you can expect fair and competetve dumpster prices when you use Mr. Cheapee. 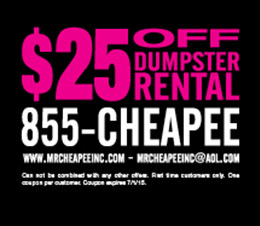 Get a price quote over the phone for trash dumpsters with no hidden charges. FULLY LICENSED & INSURED – Unlike some of our competitors, we are fully insured including demolition insurance. Certificates provided upon request. Fully Dispatched Fleet and Onsite Labor for the Removal of Trash. Loading As Needed. One easy phone call can get you a dumpster today. We have the right size dumpster for your job, you load or we load. We provide fast delivery and on-time pick up of your roll off container. 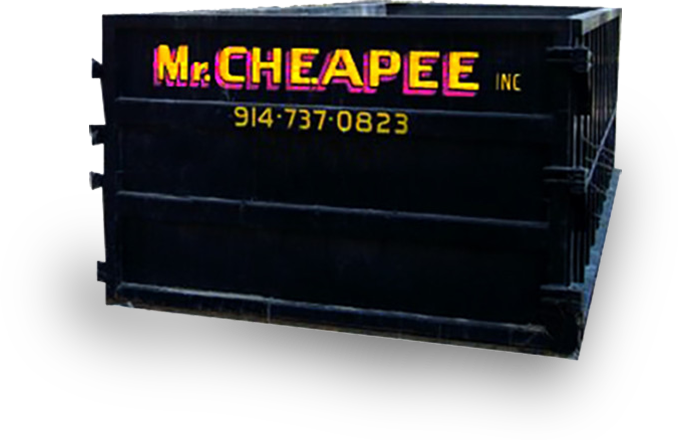 You can expect fair and competitve dumpster prices when you use Mr. Cheapee. Customer service is more than just a catch phrase at Mr. Cheapee Inc. To us, it means cultivating and maintaining strong relationships by collaborating with our clients to understand their needs and help them achieve their goals from the start. Maybe that means changing our plans to minimize disruption to a business or simply understanding that quality services mean providing prompt and accurate information without the client having to ask. We do not consider a project a success unless our client is completely satisfied. It is this attitude that has led to repeat business and high-quality work. Mr. Cheapee Inc. is large enough to offer the range of services needed, but small enough to deliver projects with personal attention to our clients’ quality standards, schedules, and budgets. Our skilled teams take pride in guiding a project from conception to successful completion. Mr. Cheapee Inc. partners with clients from the very beginning to listen to their needs and develop a clear and shared vision for a project. This interactive approach ensures quality work and attention to detail every step of the way and a finished job you can be proud of. We get it and we get it done.